Intelligent 4-Port USB-3 USB-A and 1-Port USB-C PD 3.0 and QC 3.0, for phone, tablet, e-cigarette, etc. Suitable for iPad, iPhone, iPod, mobile phone, tablet, smartphone, digital camera, bluetooth, GPS, etc. 4-port USB output with a total power of 87W. 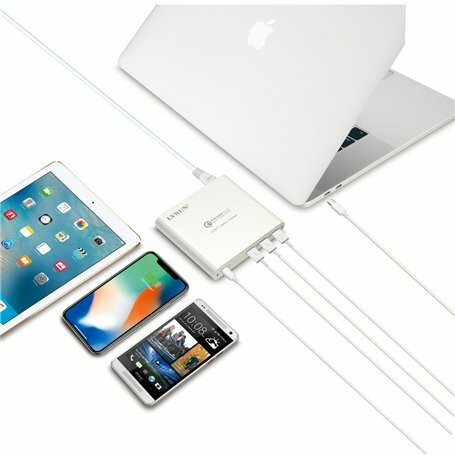 Can charge 4 devices simultaneously. Automatic detection device. Choose the best current and charging voltage for the devices. Safety and fast charging for the battery of the device. Multi-protection against overcurrent, overvoltage, short circuit, temperature. Intelligent current sensing that allows faster and safer charging for your device.